Every year at Christmas time I think of Raymond. He comes to mind at other times of the year, too, of course, but always, always, at Christmas. And this year he has been tugging at my thoughts more than usual. I wrote about Raymond in another post (which I've learned, after a little more research, includes some misinformation) and decided that I need to find out more about him. I did not know Raymond's relationship to my father's family, only that he lived with them when he was a boy. He appears with William and Tressa Doyle and their other children, Emma, Gust, and Hazel, only in the 1910 U.S. Census where his relationship to head of household is listed as "adopted son." Because of my father's comment that Raymond lived with Dad's grandparents, I guessed the adoption was informal. 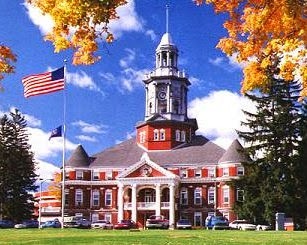 A search for Raymond in the 1940 U.S. Census found him living at the Polk State School for the Feeble-Minded in Polk, Pennsylvania, not at the Mercer County Home as I thought. He was recorded as Raymond Doyle which leads me to believe there was a legal adoption. Raymond was born between 1904 and 1905. I was told that Hazel, one of Raymond's adoptive sisters, thought he was a sweet baby and persuaded her parents, William and Tressa, to adopt him. I don't know how old he was when adopted or who his birth parents were. I don't know what happened in the Doyle family that caused Raymond to be living in Polk by 1920 when he was only 14 or 15 years old, but I have a few thoughts. In 1910, William and Tressa's oldest daughter was already a widow with two young daughters, ages 4 and 2. All three were living with William and Tressa. In 1913 my father was born and and his mother died. Tressa probably took on the care, or at least partial care, of my dad. It's easy to imagine that the whole situation, the deaths of two spouses and the addition of three children to the family, could have been overwhelming to all involved. I'd like to find adoption records for Raymond. When I wrote to a clerk at the Mercer County Courthouse I learned that all adoption records are sealed. This is my first experience with adoption and I did not realize that after more than 100 years they would still be sealed. The clerk said I could contact one of the judges. But which? The one with the most tenure, the one with the least, or the other one? Or might there be one judge responsible for adoption proceedings? I do not know Raymond's death death but did not find a record for him in the Pennsylvania Death Certificates, 1906-1963, on Ancestry. This leads me to believe that he probably died after 1963. Would an obituary have been published for someone from the State School for the Feeble-Minded? Find-a-Grave reveals no grave marker for Raymond Doyle. Perhaps he's buried in an unmarked grave, but where? Which cemetery? Neither is his information in the SSDI. Other search options are to contact the State School for the Feeble-Minded, now known as Polk State School. Their records may provide a death death and burial location, if they have records and will/can give out the information. Do you have any other thoughts on how to obtain more information Raymond? I'd especially like to confirm that there was a legal adoption. Copyright © 2014 Nancy Messier. All Rights Reserved. Just because there isn't a record on findagrave doesn't mean he's not buried there. If no one has made a memorial, he won't be there. Hi, T. You're right that findagrave doesn't have every interment in every cemetery. It was just one of the first places I looked. One of my next steps will be to look at cemetery indexes. He could be buried in either Mercer or Venango Counties. Thanks for leaving a comment.